The warehousing and distribution industries have been booming in recent years, largely because of significant increases in e-commerce or online sales. Along with this growth, there is a continued need to make warehouse safety a top priority. Consumer retail spending is increasingly shifting to e-commerce, or products and services purchased over the Internet for delivery. A 2016 eMarketer report indicates that e-commerce sales worldwide reached more than $1.9 trillion that year ($423.34 billion in North America, an increase of 15.6%), and eMarketer expects the worldwide total to top $4 trillion by 2020 (14.6% of all retail spending). 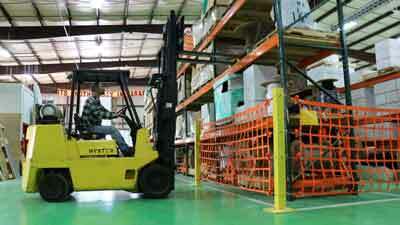 Increased online sales mean companies need more warehouse space. For one thing, they need to keep a wider variety of inventory on hand to fulfill orders. Consumer expectation of the fastest possible delivery time also means companies need warehouses that are located close to the customers and to major transportation hubs. According to a 23 June 2017 CNBC article, Amazon alone has increased its warehouse square footage from about 10 million in 2007 to more than 100 million in 2017 — and there aren’t enough warehouses in the U.S. to meet this growing demand from Amazon and competitors such as Wal-mart and QVC that are hoping to keep up. Data from the Bureau of Labor Statistics (BLS) indicates that in June 2017, there were nearly 952,000 U.S. workers employed in warehousing and storage (an increase from nearly 664,000 workers in June 2007). Keeping those workers safe in a fast-paced and hazardous environment is more important than ever, for small businesses as well as the big brands. While the creation of the Occupational Safety and Health Administration (OSHA) in 1970 led to an overall reduction of work-related fatalities by 62% and injuries by 42%, the fatality rate for the warehousing industry remains higher than the national average for all industries. According to BLS data, in 2015 there were 5 injuries for every 100 workers in warehousing and storage. Between 2012 and 2015, the average number of fatalities was 14. The three most common causes of warehouse injuries are forklift-related accidents (as many as 20,000 per year); ergonomic-related issues (lifting, pulling, pushing, reaching); and slips, trips, and falls. Loading docks, forklifts, conveyors, materials storage, and manual lifting and handling are the top five areas for injuries to occur. 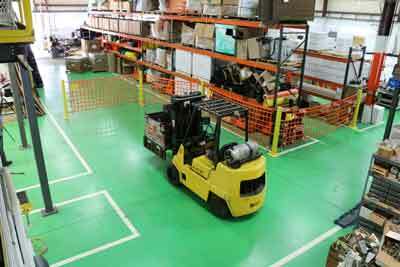 Forklifts and guarding floor and wall openings are two of the top five areas where OSHA issues citations for safety violations. Fines range from $7,000 for “non-serious” violations to $70,000 for repeat offenders. At US Netting, our business is keeping your business safe. We offer several products that can improve warehouse safety and protect your workers, your products, your brand reputation, and your bottom line. Prevent falls from the loading dock with our loading dock safety nets or one of our powerful steel Defender Gates™. The nets offer protection from the floor up, while the Ultimate Defender Gate™ has a second guard rail to prevent travel-throughs and comply with OSHA regulations. These brightly-colored barrier systems serve to clearly mark boundaries and indicate to employees and visitors that your company cares about safety. Both systems are strong enough to stop a forklift traveling at 4 mph. Heavy-duty rack safety netting is designed to keep products safely on the shelves and prevent workers from being injured by falling items. It’s easily installed on pallet racks or shelving units. Truck cargo nets can help to secure your inventory during transportation and improve loading and unloading safety. Prevent those injuries from lifting, pushing, pulling, and other handling of materials with cargo lifting nets and slings. We offer military-grade stock sizes, or can create customized solutions. Accidents can have catastrophic consequences for workers and businesses. The National Safety Council estimates that the average work-related injury can cost a company $38,000 in direct expenses and another $150,000 in indirect costs. An investment in warehouse safety equipment can pay for itself several times over if even one accident is prevented. For more information about our products or to find out how we can make your warehouse a safer environment, contact our team by calling 1-800-331-2973 or e-mailing [email protected] today.